The disposal of needles and other sharps waste is a public health and safety issue. Sharps must be properly disposed of, to prevent injury as well as the spread of infectious diseases to healthcare workers, patients and the general public. Made of strong, puncture-resistant plastic to eliminate the risk of catching sharps' stings, this AdirMed 1-Quart Sharps and Needle Biohazard Container ensures secure disposal of sharps waste. Its split-lid design and dual openings protect against accidental exposure and unauthorized removal of used and discarded items. Produced in an FDA-registered factory, this biohazard container comes in 1-, 3- and 6-count packs to accommodate your needs. Each container is labeled with a biohazard warning and equipped with usage instructions, and is outfitted with a transparent cover to offer a view of the fill-level progress to reduce overfilling. Transportable and handy, this 1-quart container can be used for safe disposal of needles, syringes, vacutainers, pen needles, lancets, blades (razors, scalpels, etc.) pipettes, glass slides and the like. They’re ideal for use in an office setting by phlebotomists (health care professionals who draw blood) or at home by diabetics who need to dispose of sharps waste. Made to bring awe to its clients, the AdirMed is designed to allow temporary closure for safety, and snap locks for final disposal. This all-new container will bring comfort and convenience to any home or workplace, boasting outstanding and excellent features to make it one of the most dependable and reliable containers in the market. DURABLE CONSTRUCTION. Sharps must be properly disposed to prevent the spread of infectious diseases and eliminate the risk of catching sharps' stings. To ensure secure disposal of sharps waste, this container is made using sturdy, puncture-resistant plastic. SUFFICIENT SIZE. Transportable, handy and safe to use, this 1-quart container is perfect for disposing large amounts of used sharps safely. Use it for safe disposal of needles, syringes, vacutainers, pen needles, lancets, blades (razors, scalpels, etc.) pipettes, glass slides and the like. SPLIT-LID DESIGN. Accommodating used sharps waste, this container is designed with a split-lid design and dual openings to protect against accidental exposure and unauthorized removal of used and discarded items. VERSATILE USE. 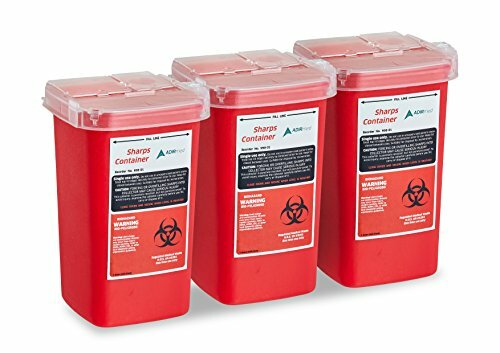 The sharps container is ideal for use in an office setting by doctors, dentists and phlebotomists (blood draw professionals) or at home by diabetics who need a small transportable container to dispose of larger amounts of generated biohazard waste. FDA-APPROVED CONTAINER. Produced in an FDA-registered factory and labeled with a biohazard warning, each single-use container is equipped with usage instructions to dispose of medical waste safely and responsibly. If you have any questions about this product by Adir Med, contact us by completing and submitting the form below. If you are looking for a specif part number, please include it with your message.